With the Baked books, it’s always so exciting to see what new things have been collected for the pages. There are always fun treats, classics with a new spin, and flavors that are sure to please. The latest is their fourth book, Baked Occasions , and I received a review copy. This one is all about celebrating holidays, both major and practically unknown, throughout the year. It gives you reasons to bake something delicious several times a month. For instance, I had no idea that National Pistachio Day is February 26th, but the Pistachio White Chocolate Cheesecake with a chocolate cookie crust looks like a great way to celebrate. Or, that might become my birthday cake in March next year. The Ultralemony Lemon Bundt Cake with Almond Glaze is another birthday cake contender. The Caramel Candy Popcorn Balls studded with chocolate candies were mentioned for Secretary’s Day, but I’d love to make them for Halloween. There are also Chocolate Cinnamon Chipotle Sugar Cookies decorated beautifully for the Day of the Dead. I could never match the colorful details as shown in the book, but the cookies sound fantastic. And, with Thanksgiving just around the corner, the Sweet Potato Tart with Gingersnap Crust and Heavenly Meringue looks perfect. Just like the other books in the series, it’s going to be fun to bake from this one. While deciding among the October holiday recipes, I realized that a.) pumpkin cheesecake is one of my favorite things, b.) I always enjoy a cheesecake swirl brownie, and c.) I’d never thought to swirl pumpkin cheesecake into a brownie. I had to try this combination. 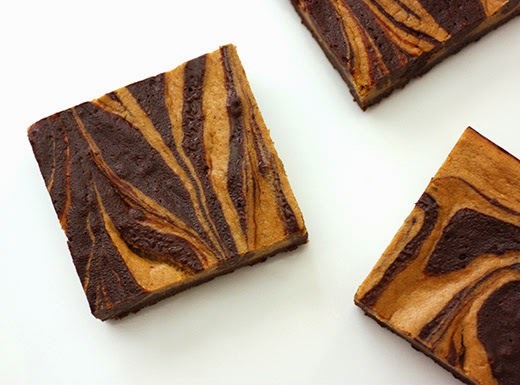 The recipe for Pumpkin Swirl Cheesecake Chocolate Brownies is offered in celebration of Columbus Day, but the reason is simply that Columbus Day falls in October and pumpkins have everything to do with October. That’s a good enough reason for me to bake them. I had some pumpkin puree in the freezer after roasting a little, pie pumpkin a few weeks ago. I set the puree in a strainer over a bowl and placed it in the refrigerator overnight. Some liquid drained from the puree to make it denser. To start the brownies, softened cream cheese was mixed with sugar, and I used coconut palm sugar. The pumpkin puree, an egg yolk, flour, cinnamon, nutmeg, allspice, and ginger were added and mixed into the cream cheese. This was left in the refrigerator while the chocolate part was made. Flour, cocoa, and salt were whisked together and set aside. Dark chocolate and butter were melted together in a double-boiler, and then coconut palm sugar and brown sugar were added and the mixture was taken off the heat. Once it had cooled to room temperature, eggs were added followed by vanilla. The flour mixture was gently folded into the chocolate. A nine-by-thirteen baking pan was used, and two-thirds of the chocolate batter went into the pan first. Next, the pumpkin cheesecake mixture was smoothed over the top. The remaining chocolate batter was spooned over the cheesecake. A table knife was used to swirl through the layers, and the brownies baked for about 35 minutes. These bake into nice, not-too-thick brownies which means you should cut nice, big squares from the pan. And, they were so easy to cut, it was amazing. The cheesecake with pumpkin and spices meandering through the chocolaty brownie was lovely. After Halloween, I need to decide what to bake for Election Day. Recipe reprinted with publisher’s permission from Baked Occasions . There are not , to the best of our knowledge, strictly regimented and traditional menus for Columbus Day. It is not Thanksgiving. Though one could skew toward Italian delicacies in a nod to Christopher’s heritage, one could also skew iconic American (hamburgers, fried chicken, apple pie) in homage to Columbus arriving in the Americas. We chose an entirely different route. We went with pumpkin cheesecake brownies, because Christopher Columbus Day is in October (to celebrate the anniversary of his arrival in America in 1492), and as bakery owners, the only thing we associate with October is pumpkin. Here is the thing about these brownies: We like them too much. We don’t mention this to be glib; we say this because they are a problem. It is the rare dessert that disrupts and overturns our years of honed self-control. Give us one bite of pumpkin cheesecake chocolate brownie, and we will eat the whole tray. At first glance, that shouldn’t happen: We like pumpkin, and we like chocolate (that is obvious), but not always together. However, the tang of the cream cheese brings everything into alignment. The brownies are super moist, the kind of moist that will leave your fingers tacky with chocolate. They are pumpkiny and fudgy in all the right ways. It’s a great dessert to welcome fall and celebrate Christopher. Baked note: Be sure to make the recipe in the order specified. The pumpkin cheesecake swirl should be made first, as the brownie batter will stiffen if it sits too long, and it will be difficult to pull a swirl through. It is not the easiest batter to swirl, but a few hefty repetitions of pulling the knife through the batter will do it. Also, try these cold: This is the rare brownie that we like directly from the refrigerator. Pour two-thirds of the batter into the prepared pan and smooth the top. Pour the pumpkin cheesecake mixture over the brownies and smooth into an even layer with the back of an offset spatula. You can eat the brownies slightly warm or at room temperature, when they have a more pumpkin-y flavor. Or cover and refrigerate them for about 3 hours and enjoy them slightly chilled (this is our favorite). Either way, when you’re ready, release the brownies from the side of the pan with a small paring knife. Pull straight up on the parchment to remove them from the pan, place them on a cutting board, cut, and serve. The brownies will keep, tightly covered, in the refrigerator for up to 5 days. Sounds like my kind of book, Lisa! I actually knew about World Pistachio Day I even have a Pinterest board for celebrating! Who could deny the goodness of these brownies though? Oh so festive and I'm sure just as yummy! Thanks for sharing, Lisa...Happy Halloween! It has turned out great, Lisa, the swirls are so beautifully done. I'm yet to try pumpkin/chocolate combo! I just got closer by looking at your brownie! I'm not much of a dessert fan, but I can eat my weight in brownies. Must try these. Thanks Lisa. I just got this cookbook also and I'm so excited to bake my way through it! Everything sounds amazing...and it makes me even more excited that they're making my wedding cake! I've had my eye on this new Baked cookbook and wondered if I really needed another book from this stellar duo. 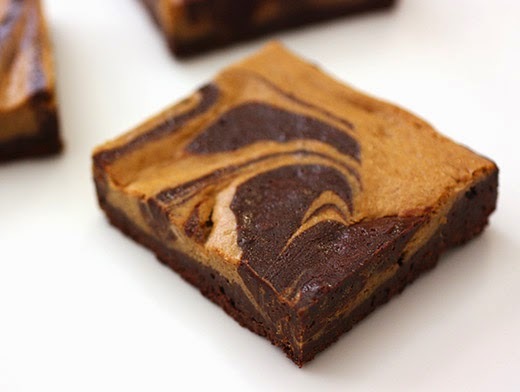 After coveting a slice of the Pumpkin Swirl Cheesecake Brownies my mind is made up! I've never seen pumpkin swirled with brownies, but I think it's a new favorite now. This is a beautiful addition to the fall dessert line-up. Love, love it. Thanks for sharing. SO pretty, and perfect for halloween. bet they're darn tasty too. This looks so cute and sinfully irresistible. 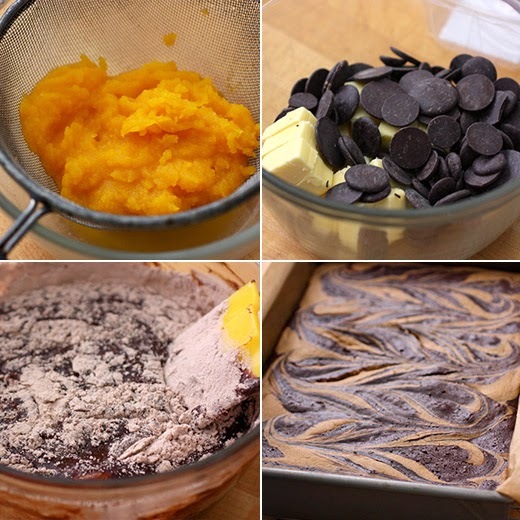 Love the addition of pumpkin to the brownies. Uh, oh. I'm two books behind! The 4th Baked cookbook is worth the price for this brownie recipe alone. They look scrumptious!!! Oh yum! These look wonderfully delicious. Pumpkin for Columbus Day would work for me! What a fun book, and great recipe. And perfect swirls! Really good post -- thanks. Well, those not only sound scrumptious, they're a work of art! Good timing too, as I've got two groups to cook for in two weeks. I'm going to add these to a couple quick breads I plan to make. Really, Lisa, I have GOT to stop buying cookbooks!! Every time I visit you, I add another to my wish list. I'll have to add on a room if this keeps up! Ha! I think a big reason we're rebuilding our house is to make more room for cookbooks! Both you "lovely" ladies are more than welcome to share your unlimitless supply of cookbooks on Cookbook Wednesday!!! Hi Lisa, love brownies, they are the perfect dessert, love that you swirled pumpkin in here.